The 100% natural, provides effective relief from respiratory infections, colds, wheezing, and sniffles. For hamsters, guinea pigs, gerbils, mice, rats, ferrets, chinchillas, lemmings, and minks. These conditions (colds, snuffles, pneumonia) are characterized by a change in respiration, often reflected in rate, depth, noisiness and distress. Coughing, sneezing, snorting and wheezing may also occur. Occasional symptoms are watery eyes and a pus-filled nasal discharge. Animals whose lung tissue is affected have a reduced oxygen exchange level and show “air hunger”, exaggerated breathing effort, with difficulty in drawing or expelling air. Frequently, colds can develop into pneumonia, since it is believed the same bacteria which result in colds can move down the respiratory passages into the lungs. Signs of pneumonia are loud gasping noises and increased difficulty in breathing. Treatment: Use VETRx™ Remedy warm. To warm, open cap and put bottle in small pan of heated water. Shake well. Always test temperature of product before applying. 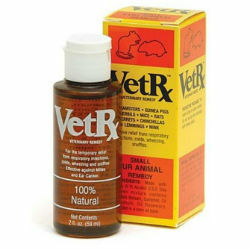 Depending upon size of animal, place one or two drops of warm VETRx™ on each side of nostril. Apply one drop, by hand, to any scabbed area. Repeat twice daily, until symptoms disappear. To clean, fresh water (changed daily) add eight drops per gallon. Globules may rise to the top. These contain some medication that can be helpful if consumed internally. Note: VETRx™ will leave an oily film on skin and fur. This will not burn skin or remove hair. It will, in fact, help destroy any mites or mite ova which may be present. 3.3% (v/v) alcohol U.S.P., Canada balsam, camphor, oil of origanum, oil of rosemary, corn oil.